Dear friend Diana from Wales U.K. writes, "Has spring arrived in New York? We (and the plants) are still freezing and the wind is from Russia!! Certainly we normally have some green shoots by now but this year is horrendous and the temperatures are still around freezing. Not so good for the garden, everything is stuck waiting for the soil to warm up." Yes Diana, it's spring here, even if I have to use my close-up lens to find it. Above, some early Euphorbia, the only plant in full bloom on my roof garden. Tulips making an appearance, though the poppy seeds I planted in this container last week are still in hiding. If I lie down at set my camera 6" away, I can see the buds of grape hyacinth planted last fall in tree pits in front of my building. Upstairs on my south-facing office windowsill, seeds of 'Super Bush' tomato, basil 'Profumo di Genova' and Portulaca 'Pastel Sundial' give me real hope for warmer weather. The basil shoots already have a strong flavor, and as I thin them in the container, I'll use the sprouts for dinner recipes. 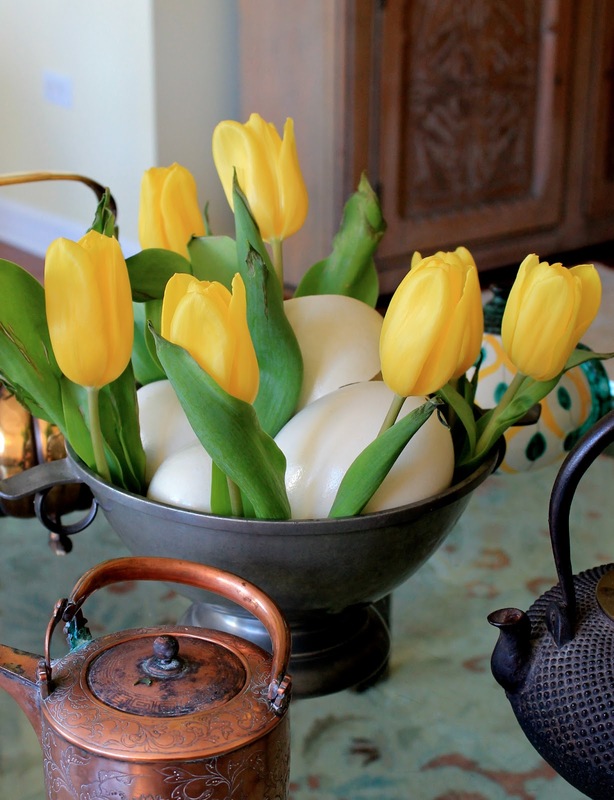 Since I need some immediate bloom, my corner grocery store provides me with yellow tulips to mix with some rhea eggs I've saved for years. We are even beginning to see buds up here in Massachusetts. A much needed welcome sign of spring. Diana wrote "I loved your blog- happy to provide copy any time!!!"